Last year, we embarked on our Guthrie Family Adventure to Universal Studios in Florida. One of the biggest attractions the kids wanted to see was Minion Mayhem. They laughed at the banana farts and their stomachs lurched as the ride raced us around Gur’s secret lair. It was the highlight of their trip. This perfect Minion sized coffee mug was my souvenir of the trip. 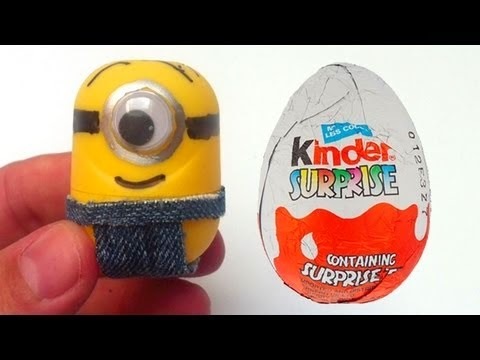 You can now find new Minion toys inside specially marked Kinder Surprise Classic Eggs. There are 11 to collect. Isn’t it cool how the egg shape resembles a Minion? Our next arts and crafts time we are building Minions watch for our creations on my Twitter and Facebook pages! Who wants to win a Minion-themed prize pack worth $40.00, in preparation for the new Minions movie which is a prequel to the Despicable Me movie? The winner will be emailed on Monday March 25th, 2015. Good Luck! PSSST! I have a secret to share with my readers. On Friday, May 22 join us for an extra-fun Kinder Canada Facebook page giveaway. For fans who’ve collected all 11 Minions toys, there’s a chance to win four tickets to see the Minions movie in theatres when it comes out this July. ← Special Olympics Fundraiser Today in Kemptville!